Images of birds were represented in several different ways within the Cahokia culture. The heads of ducks were sometimes placed on the rims of pots. But the most important images of birds were birds of prey. The majority of these are in the form of, or in reference to, falcons. The most famous example from Cahokia is the engraving of the winged human on the Birdman Tablet, which is a representation of a falcon warrior. The front view of the Franke pipe is impressive for its simple design and powerful image of a bird. In art, it's difficult to draw a limited number of simple lines and achieve a strong image. The Franke pipe is a good example of abstract art. The image of a bird is immediately recognizable even though there was no attempt to include a head, tail or legs. It’s been suggested that the Franke pipe might represent a falcon. The dramatic curve and bold outline of the wings are the only clues that offer this as a possibility. The falcon in Mississippian iconography is an image that researchers often refer to as the Falcon Warrior or the falcon impersonator. Falcon war-related images have been found embossed in copper, engraved in shell, modeled in clay and sculpted and engraved in stone. The most famous image of the falcon impersonator is embossed on the Rogan copper plate from the Etowah site in Georgia. 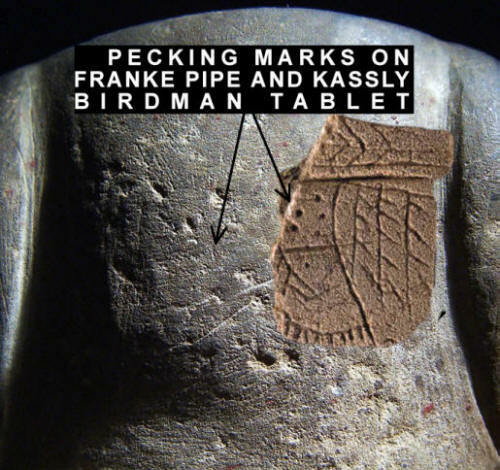 Pecking marks on the front of the Franke pipe seems to relate to the image on the Kassly Birdman Tablet. Both of the images have pecking marks on either the beast area of the bird or the chest area of the falcon impersonator. 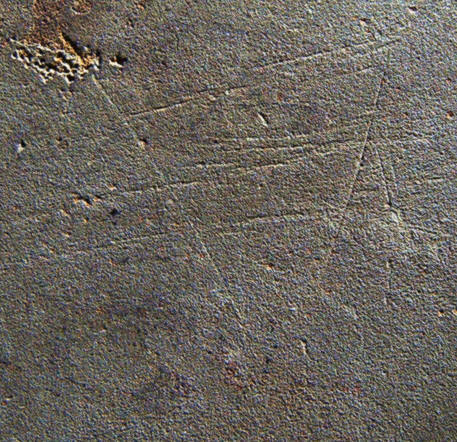 These marks may be representations of breast feathers. The wing design of the Franke pipe is also similar to another bird effigy pipe, from the “old time” Patrick collection, that was found many years ago near the Cahokia site in St. Clair County, Illinois. The Patrick pipe also appears to have pecking marks on the breast area. Another important characteristic of the Franke pipe is a series of shallow parallel lines that are worn into the surface of one side. They appear to be abrader grooves that were caused from sharpening bone needles. Mississippian sandstone pipes from the Cahokia Mounds area were commonly used as abraders. Sandstone pipes, and some red flint-clay pipes, were apparently used during the process of tattooing or scarification. Sandstone pipes are found in all stages of wear from the abrading process. Completely exhausted examples were left with only two original conical holes. The bottom of the Franke pipe also has a few very fine scratches and one X that may or may not be abrader marks from sharpening bone needles. This picture shows a series of shallow parallel lines that are worn into the surface of one side. They appear to be abrader grooves that were caused from sharpening bone needles. Mississippian sandstone pipes from the Cahokia Mounds area were commonly used as abraders. 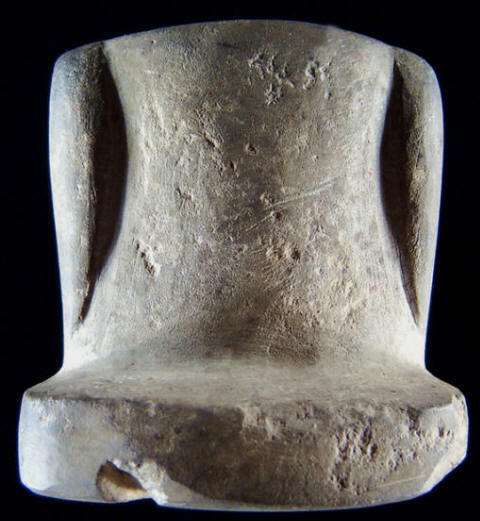 Sandstone pipes, and some red flint-clay pipes, were apparently used during the process of tattooing or scarification. Sandstone pipes are found in all stages of wear from the abrading process. Completely exhausted examples were left with only two original conical holes. The Franke pipe also seems to have a darker surface area on top and part way down the sides. 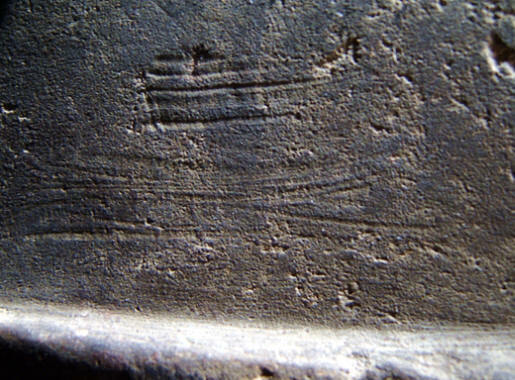 This may be original to the artifact or caused from handling in recent years. Discoloration from hafting is sometimes observed on Mississippian celts. Since the Franke pipe is made of a very fine grained sandstone it might have absorbed and retained some of its original ancient residue caused from smoking or other uses. The bottom of the Franke pipe has a few very fine scratches and one X that may or may not be abrader marks from sharpening bone needles. The Falcon was the insignia of a military cult among the ancient Mississippians. If the Franke pipe does represent a Falcon, even in abstract form, it might have been used in more than one type of ceremonial event. It was apparently used for both smoking and the sharpening of needles. The Franke pipe may have been one of the instruments that were used to bring initiates into some type of cult or society. But at the very least, the Franke pipe represents a unique form of Mississippian abstract art. Its simple lines project the easily recognizable image of a bird. 1982, Emerson, Thomas E., "Mississippian Stone Images In Illinois," p. 2. 1983, Emerson, Thomas E., "The Bostrom Figure Pipe And The Cahokian Effigy Style In The American Bottom," Midcontinental Journal Of Archaeology, Vol. 8, No. 2, p. 257. 1985, Brown, James A., "III. The Mississippian Period," Ancient Art Of The American Woodland Indians, p. 113-114. 2004, Power, Susan C., "Early Art Of The Southeastern Indians, Feathered Serpents & Winged Beings," p. 139. 2006, Werness, Hope B., "Encyclopedia Of Animal Symbolism In Art," p. 171. Personal communications with Jim Marlin.